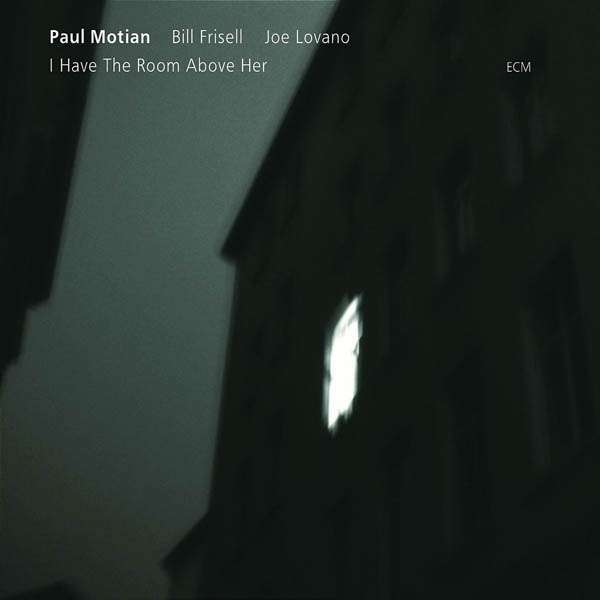 Der Artikel Paul Motian, Bill Frisell & Joe Lovano: I Have The Room Above Her wurde in den Warenkorb gelegt. "I Have The Room Above Her" marks the return of Paul Motian to ECM, the label that first provided a context for his compositions and his musical directions. The great American-Armenian drummer, now in his 74th year, is currently at a creative peak, and his trio, launched in 1984 with the ECM album "It Should Have Happened A Long Time Ago", has never sounded better. Motian, of course, has continued to be an important contributor to ECM recordings over the years -- see for instance his recent work with Marilyn Crispell and with Paul Bley - but hasn't recorded as a leader for the label in almost 20 years. His anthology in ECM’s Rarum series, however, released at the beginning of 2004, served as a powerful reminder of just how original his musical concept remains. As a drummer, improviser, composer of intensely lyrical melodies, and musical thinker, Paul Motian is a unique figure, and a musician of vast and varied experience. As a young man, he played with Thelonious Monk, whose idiosyncratic sense of swing (and stubborn independence from all prevailing trends) was to be a lifelong influence. Motian played with Coleman Hawkins, with Lennie Tristano, with Sonny Rollins, even, fleetingly, with John Coltrane. As a member of the Bill Evans trio with Scott La Faro, he changed the course of modern jazz, then changed it again by bringing new impulses to the freer, more abstract music of Paul Bley. When he met ECM producer Manfred Eicher, he was the drummer with Keith Jarrett's trio with Charlie Haden, soon to become, with the addition of Dewey Redman, Jarrett’s great “American Quartet” , another unit of seminal importance in the development of creative music. Encouraged by Eicher to write his own pieces, Motian drew upon both his jazz history and his Armenian / Turkish roots, developing a unique body of material subsequently delineated on albums including "Conception Vessel" (the first album issued under his name), "Tribute", "Dance", "Le Voyage”, "Psalm" and more. (Marilyn Crispell’s 2004 ECM album “Storyteller” was also largely devoted to Motian’s writing). “Psalm”, a Motian quintet disc from 1981, introduced many listeners to the exceptional talents of guitarist Bill Frisell and saxophonist Joe Lovano, both of whom had yet to release albums under their own names. Meanwhile long-established as two of the most creative improvisers anywhere, multiple poll-winners, prolific recording artists and ensemble leaders in their own right, they have been loyal to Motian through the years, putting aside time for the trio, keen to keep their special group understanding alive. Bill Frisell still insists that "the Paul Motian Trio is one of the most rewarding and inspiring musical situations I have ever been in". In the New York Sun, Will Friedwald wrote that while “lots of drummers are about power and energy, Mr Motian is about supporting a soloist with exquisite colouration and holding an ensemble together. In this case, this is an especially tricky task, since there is no piano or bass, and Mr Frisell does just about everything but lay down conventional chord patterns on his guitar." Motian’s understanding of “support”, however, is like no one else’s, his outflung net of percussion can catch or cushion a soloist, provide contrapuntal commentary (Motian is a decidedly ‘melodic’ drummer) or simply leave space for an idea to develop more fully. Nuance is everything, and sound, far more than “technique” is the impetus for the ways in which the music flowers. And yet, whether a pulse is stated or otherwise, the music dances. Ben Ratliff in the New York Times observed that the trio’s music can be both “gentle” and “fractious”, capable of “dismantling a tune completely” while still retaining transparency at all times, as well as a poetic sense of swing. All these qualities are in evidence on “I Have The Room Above Her”; an album that is fresh, challenging, supremely assured. Joe Lovano and Bill Frisell have grown immensely as players since Motian first took them under his wing. For many critics, Lovano now stands as the pre-eminent jazz tenorist of our time (a “saviour” of jazz according to Whitney Balliett in the New Yorker), Frisell an outstanding sonic explorer, an improviser whose work spans all the idioms that can be termed American. “I Have The Room Above Her” also happens to be Frisell’s first new ECM recording in almost a decade, after Kenny Wheeler’s “Angel Song” with Lee Konitz and Dave Holland. The range of music on the new disc, recorded April 2004 in New York’s Avatar Studios, includes recent compositions by Motian, a revival of “Dance”, title track of a 1977 ECM album (with another great trio, with David Izenzon and Charles Brackeen), Thelonious Monk’s “Dreamland” and the Jerome Kern / Oscar Hammerstein standard “I Have The Room Above Her”, written for the 1936 film version of the musical “Showboat”. Several other recordings with Paul Motian are in the pipeline at ECM. These include a brand-new album with his Electric Bebop Band, trio albums with Enrico Rava and Stefano Bollani, and with Bobo Stenson and Anders Jormin, and a quartet album with English saxophonist Martin Speake.